At Kryzia Kreations, all the jewelry designs are completely hand-fabricated by myself, jewelry designer and artisan, Christina Paluszek-McClure, using traditional metalsmith techniques. As a self-taught jeweler, I fell in love with metalsmithing because it intrigued me that you could take something so cold and hard as metal, and form it into something so delicate, wearable and beautiful as jewelry. My design process generally begins with a variety of sketched ideas, inspiration boards, samples of gemstones, pearls or found objects, and ideas for any metal textures or details. 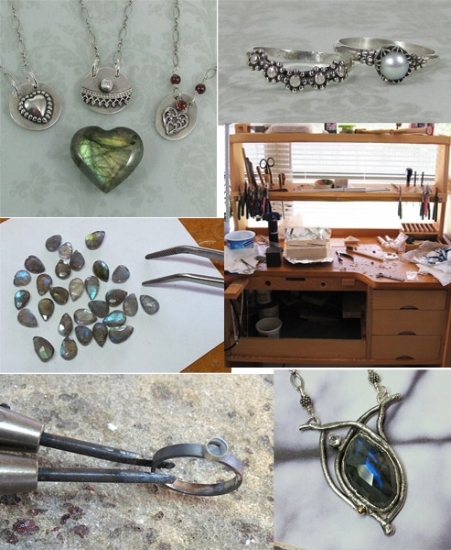 From here, I begin to manipulate precious sheet metal and wire into various shapes, and then begin adding the intricate details of texture, hand-woven wire, granulation, hand-engraving, patinas and color, semi-precious gemstones or found objects. All the handmade designs are either limited edition or one of a kind because I believe you should wear original pieces that reflect your own individuality. Stones, whether precious or semi-precious or just pebbles or shell washed up on the beach, play a big role in many of my jewelry designs. Some stones, such as agates and jaspers, can tell a story all on their own, while others, such as sapphires, garnets, and even diamonds, add that perfect bit of color or sparkle to a delicate design. I have a strong belief that we should be kind to our environment, so I try to fabricate my jewelry in the most socially and environmentally friendly way possible. Each handcrafted piece is made from recycled precious metals, ethically sourced natural gemstones, and conflict free diamonds that are mined in accordance with the Kimberley Process and purchased from legitimate suppliers.